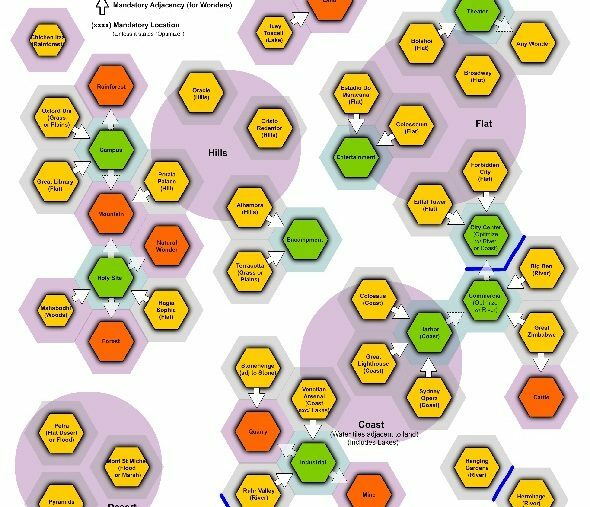 Among the many changes Civilization VI makes to the classic formula, ‘unstacking’ cities into expanding districts might just be the most radical. 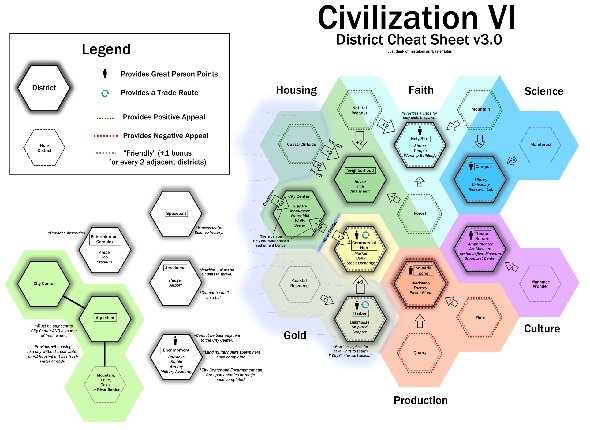 Districts are the only places where certain specialist buildings can be constructed, and they gain a whole mess of different adjacency bonuses that can be overwhelming even for series veterans, as this is the first time such a system has existed in Civ. Compounding the challenge is the fact that there are only so many usable tiles around any of your cities, so you’ll have to plan ahead of time how to lay them out. As if unstacking cities into districts wasn’t challenging enough, Wonders in Civilization VI now also take up a tile of their own, and come with various terrain and adjacency requirements that can further complicate your city planning efforts. Civilization VI is, unquestionably, one of the best strategy games on PC. Their completion is crowned with a cool construction scene and you can physically see them on the map for the first time in the series (unless you count Beyond Earth). This gives Wonders in Civilization VI a real sense of majesty. However, it’s easy even for series veterans to forget their many prerequisites, and find too late that they simply can’t build a Wonder which they had planned to (as Phil and Joel discovered to their cost in our Civ 6 Let’s Play series). As you can see, every single Wonder in Civilization VI has a terrain type requirement, and many have one or more adjacency requirements further to that. 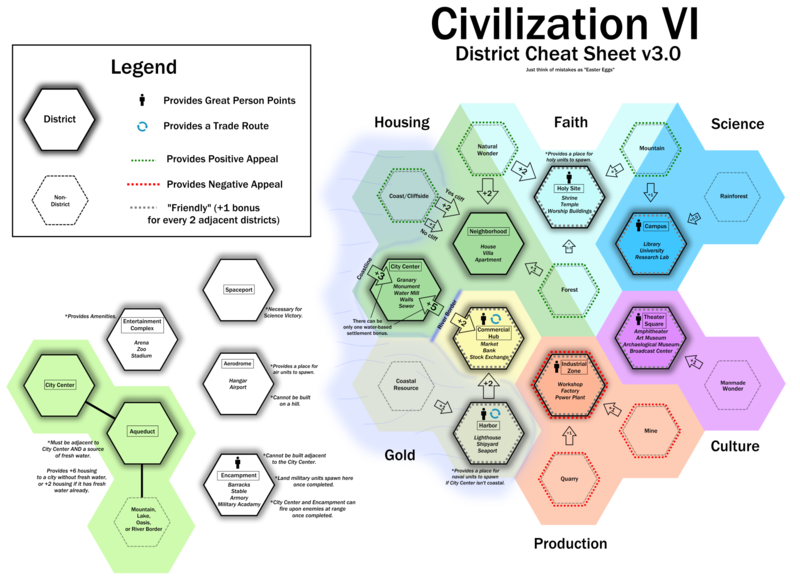 On top of the requirements for district placement, outlined below, city planning becomes a critical skill in Civ 6 for the first time in the series. Campus districts generate Great Scientist points, with science bonuses for adjacent mountains (+2 each), rainforests and other districts (+1 for every two of each). Libraries, universities and research labs can only be built here. Holy Site districts generate Great Prophet points, with faith bonuses for adjacent mountains (+1 each), Natural Wonders (+2 each), forests and other districts (+1 for every two of each). Shrines, temples and worship buildings can only be built here. Theater Square districts generate Great Artist points, with culture bonuses for adjacent man-made Wonders (+1 each) and districts (+1 for every two). Amphitheaters, art and archaeological museums, and broadcast centers can only be built here. Commercial Hub districts generate Great Merchant points, with gold bonuses for adjacent harbours (+2), rivers (+2) and districts (+1 for every two). Markets, banks and stock exchanges can only be built here. Industrial Zone districts generate Great Engineer points, with production bonuses for adjacent mines, quarries (+1 each) and districts (+1 for every two). Workshops, factories and power plants can only be built here. Harbour districts generate Great Admiral points, with gold bonuses for adjacent coastal resources (+1 each) and districts (+1 for every two). Lighthouses, shipyards and seaports can only be built here. Encampment districts generate Great General points. Barracks, stables, armories and military acadmies can only be built here. There are no adjacency bonuses associated with this district, as with spaceports and aerodromes, so these can be placed in otherwise useless tiles. Neighborhood districts provide housing, with bonuses based on the appeal of the tile, as well as directly, for adjacent Natural Wonders (+2 each), forests (+1 each) and coasts (+1 each). The coastal bonus is doubled if there is a cliff. Aqueductsalso provide +2 housing if adjacent to a city center, but a massive +6 housing if they arealsoadjacent to a source of fresh water and the city isnot. Entertainment complexes provide amenities. Arenas, zoos and stadiums can only be built here. When considering a new place to settle, then, consider what your empire needs most. 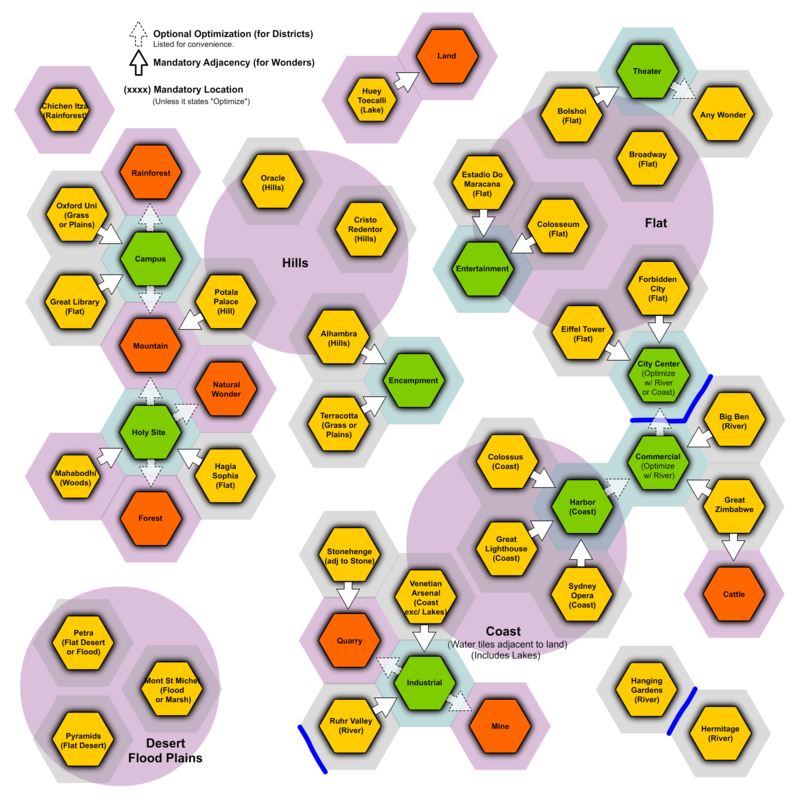 Best to have a chosen victory condition in mind, which squares well with your empire’s unique abilities; it’s more possible to change strategy on the fly in Civ 6 than before, but not so much that you can afford to squander settlers by building redundant cities. A site with a couple of mountains will be good for faith and science. Coastal cities should grow quickly as neighbourhoods will flourish here, and are also good at generating gold. As ever, any place with hills or stone – where you can build quarries and mines – will be great for production, since you can put down an industrial zone next door. Culture is trickier, as only other districts and manmade Wonders provide adjacency bonuses to theater squares. If you can develop a high-production city with a decent chance of grabbing a Wonder or two, have a think about whether you could build your Wonders around a theater square. Be realistic about how much return you can expect from different adjacent terrain. 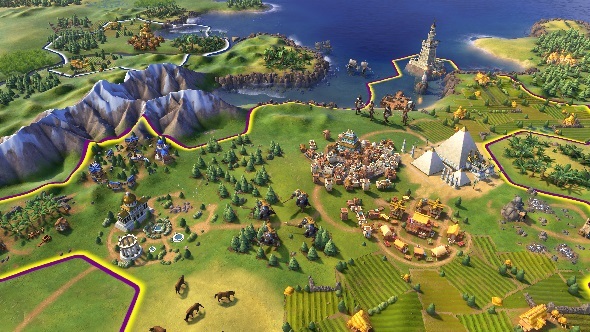 You’ll never get more than one Natural Wonder in one city’s territory let alone adjacent to the same Holy Site, and you don’t want to be committed to leaving four rainforest tiles undeveloped all game for +2 science. Mountains are better for both faith and science, while we’d advise against planning your city around the weak return you get from forests or rainforests. Remember that you can buy tiles directly with gold, so don’t worry if your city planning ideas seem a little ambitious at first.